I have always had an interest in history and especially my personal family history. Until a few years ago, before the development of genealogy programs and Internet databases, tracing your roots was a slow and time consuming process. It still requires patience and a lot of investigation but the record keeping and research is now much easier. About five years ago, encouraged by the ease of using a computer genealogy program, I began in earnest to document the lives of my ancestors. 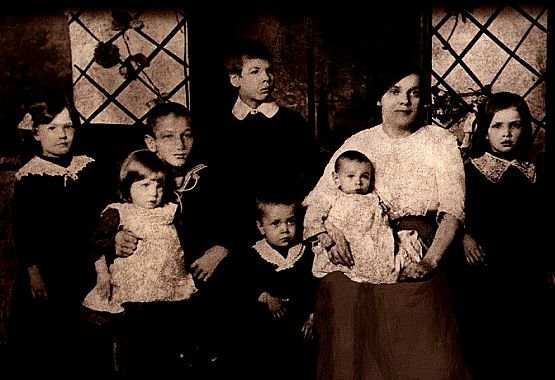 In the course of this research I found that my grandmother, Jean Gardner Moores, arrived in the US from Glasgow, Scotland in 1926 following the route most of her siblings had taken. Further investigation showed that her mother, Elizabeth Brown Gardner had come from a small town with a population less than 5,000 by the name of Maybole, which is today about an hour drive south of Glasgow. 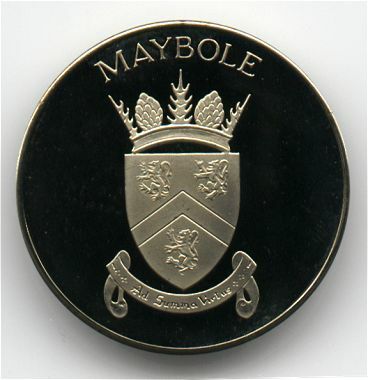 It was in the late summer of 1999 that I registered the domain name of maybole.org with the intention of sharing with other family historians the information I had gathered about my ancestral home of Maybole. Shortly after posting a few pages to the site I was contacted by David Kiltie, Chairman of the Maybole Community Council. David asked if I was "prepared to see the site expanded?" And so it has been. 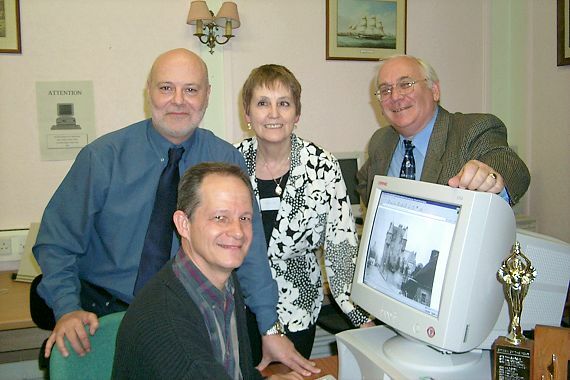 The site now has over 750 pages and several thousand images and documents the town's past as well the lives and spirit of its citizens today. It is the result of the cooperative involvement of the residents of Maybole, Maybole's Internet community at large and in no small measure David Kiltie. New items are added each week as visitors from the town and around the world continue to send in photographs and stories. 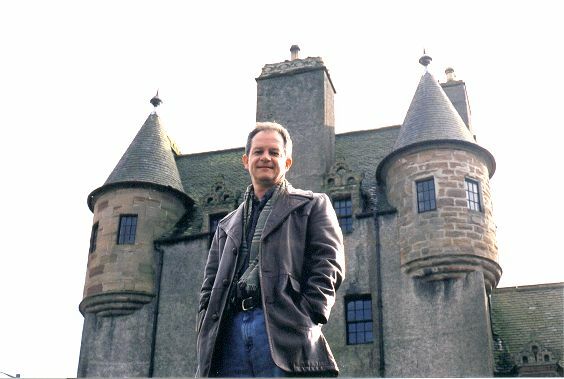 Being webmaster for the site has been a tremendously rewarding experience as I am in touch with people from around the world with an interest in this small but richly historic region of Scotland. Many site visitors share this enthusiasm and have given us inspiring compliments some of which have been posted on the site. 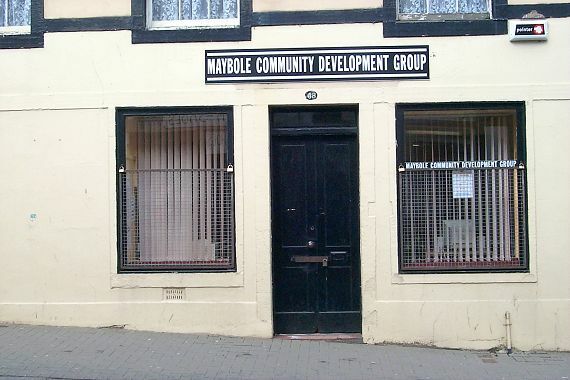 I received an invitation from the Chairman of the Maybole Community Council to visit Maybole in April 2001 as part of a community project to raise awareness of the website for the town. The site whose address is www.maybole.org played a key part in convincing Scottish Enterprise Ayrshire to fund a project to make 2000 local people aware of the site, to encourage 200 to contribute to it, and to have 20 people take up IT training. These funds were used to provide equipment and training classes to advance computer and technical skills among the residents of the town. Their offer to pay for my plane ticket wasn't one I was going to pass up. I asked my son Nick to accompany me on the trip as my travelling companion, technical aid and to give him a first hand view of our Scottish heritage. We left our home in Clearwater Florida at 2:30 April 14th, 2001 with our video, digital and 35mm cameras, tape recorder and all the batteries and film we could stuff into various parts of our baggage. Arriving in Orlando we changed from Florida shorts pants and T-shirts to warmer clothing and were at the terminal just in time to check-in 2 hours before departure as instructed. Our flight on Icelandair departed at 7:00 precisely on schedule. Looking out our window on the final approach to Iceland, our connection to Glasgow, there was a crescent moon just above the horizon. Our position above it in the predawn light seemed very odd. We arrived in Iceland at 6:00 am local time just as the sun was rising. Ice flows off the coast told us we had left our topical climate far behind. As we landed we saw a barren landscape with large rocks strewn about which looked closer to the surface of the moon than that of our own planet to which we were returning. On exiting the airplane we entered a concrete and plywood structure as stark and cold in appearance as the exterior we had just seen. "Under Construction" signs needlessly posted on the walls marked this strange midpoint in our journey further underscoring that we were on our way to a "new land". We spent two hours wandering about the few square feet of the terminal, which included two small gift shops, a small snack counter and not much more. There would be no boarding call for the flight. We were told to simply observe the small monitor in a corner of the snack counter which listed the status of all seven arrivals and departures. On our final approach to Glasgow shortly before 11:00 a.m. we looked out our window to see snow-covered mountains alternating with vast stretches of green hills dotted with cottages and sheep. 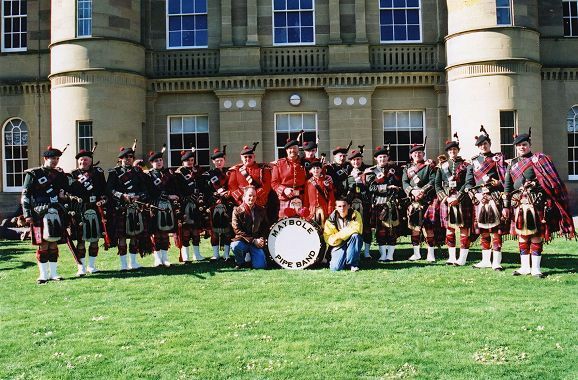 Finally we were in Scotland. David Kiltie, Chairman of the Maybole Community Council, greeted us just after we cleared customs. Stopping for a few minutes to have a cup of coffee with this man whom I had till then only communicated with by email for the past 18 months was our first introduction to the pleasant but sometimes difficult to understand Scottish tongue. We picked up our rental car and after a few minutes vainly attempting to put the car in reverse our host for the trip came to the rescue and off we were. Driving on the left side of the road, while seated in the right side of the car was difficult enough even if we had not already been awake for some 15 hours but the roads were also narrow and the traffic signs unfamiliar. With my son Nick riding in the left side front passenger seat I had a concerned observer watching just how close we were getting to the left side curb. Just before reaching Maybole I strayed a bit too much off the road and we felt a sharp bump under the front left tire. Quite excitedly Nick also told me that he had seen a hubcap fly over the top of our car and that it was lying in the middle of the road behind us. After a short trip to retrieve the rest of our vehicle we were soon at the bed and breakfast to be our base of operations for the rest of the week. 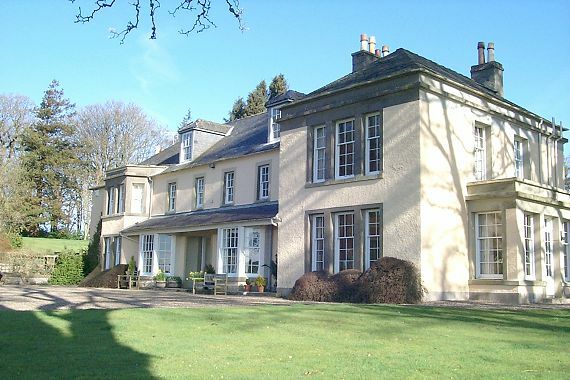 We arrived at Drumellan House just outside of Maybole on a bright sunny afternoon to find our hosts Peter and Patti Kewney struggling to lift a pool table into the downstairs den. Quite happy we assisted them with this since it was for our benefit. We were then shown to our room upstairs. 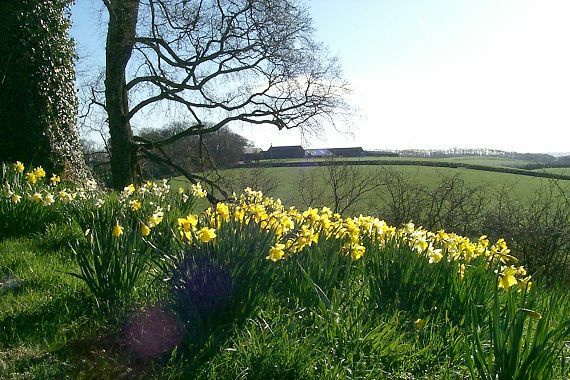 From our second story window we could see rolling green hills, grazing sheep and brilliant yellow daffodils in a scene fit for a travel brochure. This historic residence was beautifully decorated and we were to find very aspect of our stay completely to our satisfaction. Peter and Patti were the perfect hosts and wonderful conversationalists. 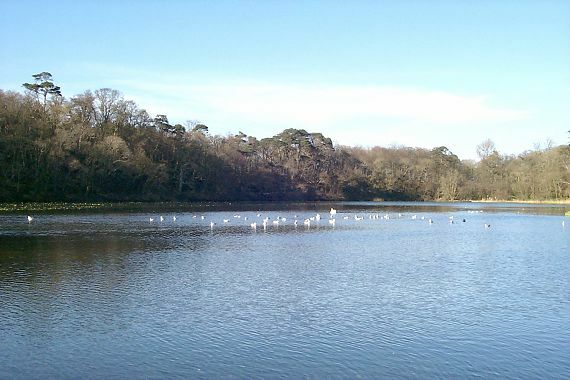 After a brief rest we were picked up by David Kiltie and drove to Culzean Castle about 10 miles to the west of Maybole. 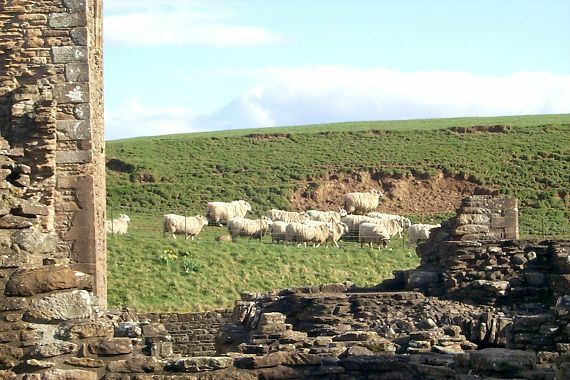 This historic landmark was one of the first properties placed with the National Trust for Scotland and is one of the most visited castles in Scotland. 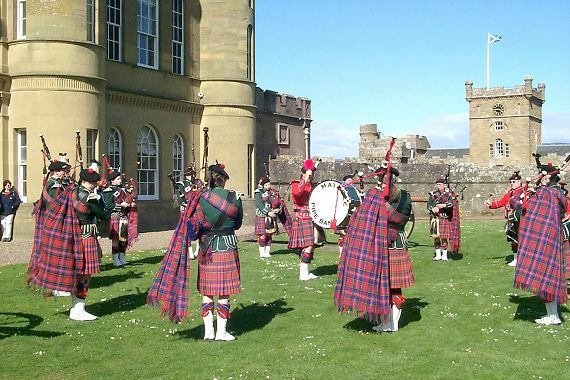 On the castle grounds we were greeted by the Maybole Pipe Band as it performed for Easter Sunday visitors. Dressed in their McPherson red tartan colors they were a fantastic welcome and confirmation that we were indeed in Scotland. 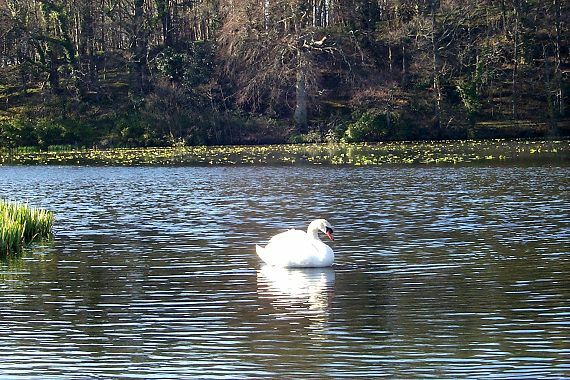 After some 50 introductions to local citizens and several photos with the band we stopped at Swan Pond, a part of the castle grounds and favorite local recreation area. After several obligatory photos of the idyllic setting we left the grounds driving by posted notices that the footpaths were closed to prevent spread of Foot and Mouth disease. I could not help but wonder if the rabbits I had seen scurrying across the road ahead of our car were observing the posted warnings. Our last event for this first long day was dinner at the Welltrees Inn in Maybole with David and a small crowd of dinner companions. Nick was introduced to a shandy. A drink, half of which was a mildly alcoholic beverage and the other half a soft drink. Our Scottish dinner guests, already a bit difficult to comprehend while speaking to one another soon become quite unintelligible to Nick as the second glass began taking effect. Feeling quite weary myself I explained that I needed to get Nick to bed. We found our way back to Drumellan House and with no need to recount the hundreds of sheep we'd already seen were soon fast asleep. 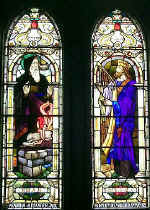 Easter Monday, as it is called in the UK, began with an appointment to meet Rev. 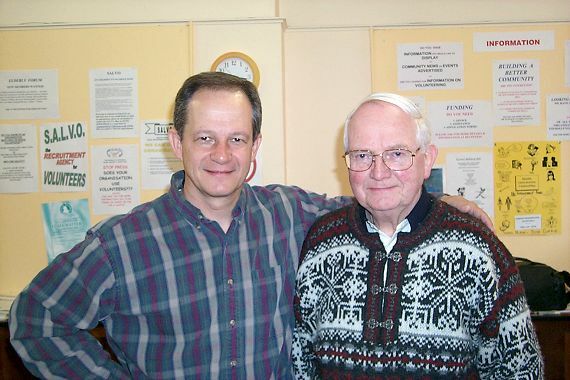 Dave Whiteman, Minister of Maybole Old Church. We met at 10 am in the Dairy Corner, a small restaurant on High Street in Maybole. After a brief refreshment and introduction to Dave's wife Susan and their two young daughters we were then taken on a short walk to the Auld Cemetery where is it thought that over 20,000 former inhabitants of the town are buried in a few small acres. Most of these are unrecorded and many of the few gravestones that remain are worn almost beyond legibility. We took photos of the more interesting stones and wandered about until we came to Maybole Old Church. 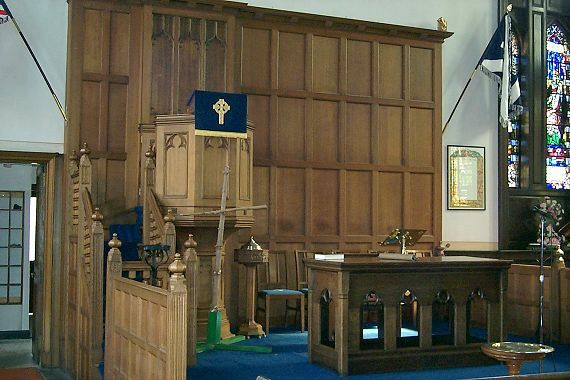 From my research I knew that some of my Maybole ancestors were baptized and married there. They also had at least enough funds to be able to contribute to the repair of the church as recorded in church documents of 1874. We were given a tour of the inside of the church built in 1808 by our hosts and took photos of some of the beautiful stained glass windows. We then visited Rev. 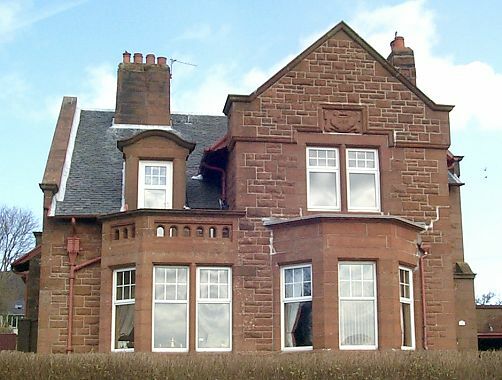 Dave Whiteman's home known as the manse or minister's house. There we were shown a large black metal chest, which David explained, had been discovered in the attic of the church while repairs to the roof were being made. We explored the contents of the box for a few minutes as David pulled out one historical document after another, some being several hundred years old. I was trustingly lent the box for the week of our stay and found quite a few treasures some of which will later appear on the Maybole web site. 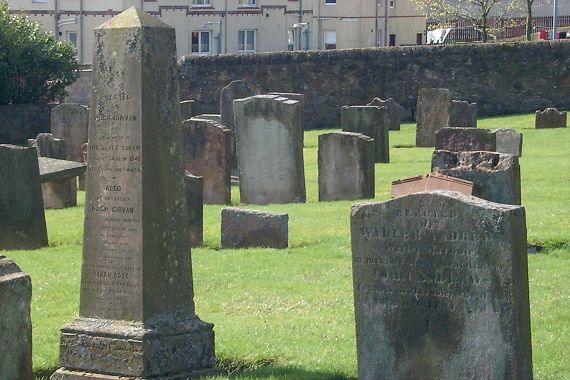 As we were on the second floor balcony of the manse being told the tragic tale of a former minister's wife who had fallen to her death while washing windows there, David Kiltie arrived to take us to our next destination, the New Maybole Cemetery. 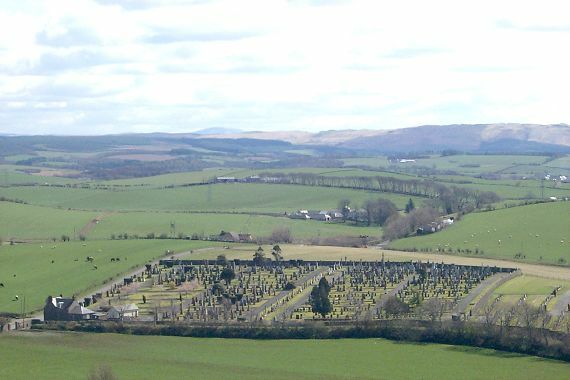 The New Maybole Cemetery lies at the bottom of the hill on which Maybole is built. It was opened for burial in 1852 and is still in use today. I knew that some of my ancestors were buried here as we had already been sent a photo of the gravestone and burial record. After some 15 minutes of wandering around the perimeter of the cemetery we found the grave and took a few photos. I wanted to take a few more photos for the web site of some of the more interesting monuments so we walked further into the cemetery to do so. It was while looking through the lens of my camera at one of these headstones that I realized the names on the monument I was photographing were those in my own family tree! If I had come looking for this I probably would never have found it. What a fortuitous discovery this was! Every detail of the headstone was noted and more photographs taken. The inscription even listed several more, until now unknown, generations. More photos of other headstones were taken before we left for a tour of some of the countryside south of town. More rolling hills and sheep were counted as we drove through several small neighboring villages. As it was getting well on into the evening we were surprised at how long the daylight lasted after sunset. David explained that this was due to our distance north relative to Florida and that in summer it could remain light until almost midnight. 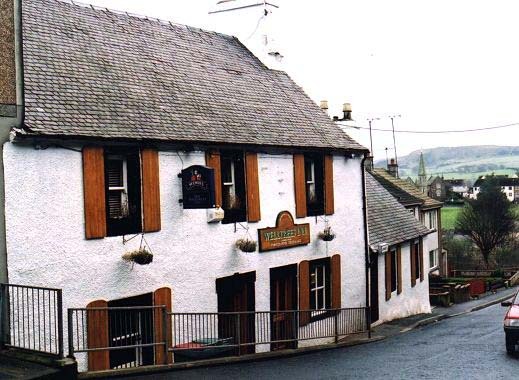 We had dinner that night at a small village pub and enjoyed a bit of Irn Bru. Pronounced Iron Brew it is the most popular drink in Scotland we were told. Something similar to coke to those in the US, otherwise an indescribable but good tasting refreshment. Our second day in Scotland coming to a close we headed for our beds by now having adjusted our biological clocks to a time zone five hours earlier than ours. After a hearty breakfast of smoked haddock and bacon at Drumellan House we headed into Maybole for a stop at the Maybole Community Development offices (MCDG) to meet with Peter Walker, community development officer and other members of the staff. The newly established facilities on High Street provide free computer use and Internet access to residents with the hope of encouraging those unfamiliar with these tools to be introduced to them. 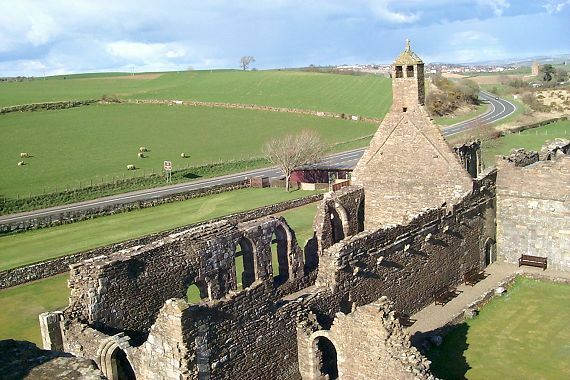 Those showing an interest are then given the opportunity to pursue further instruction through May-Tag, a local training agency located in Maybole Castle. After a few hours at the MCDG offices we headed to world-renowned Turnberry Golf Resort escorted by Alex Kelly, a member of the Maybole Community Council one of several local posts he holds. Arriving about 1:30 p.m. on a slightly overcast day we were given an extensive tour of the resort followed by tea with the director of HR in an elegant wood paneled dining room overlooking the golf course and the Firth of Clyde. 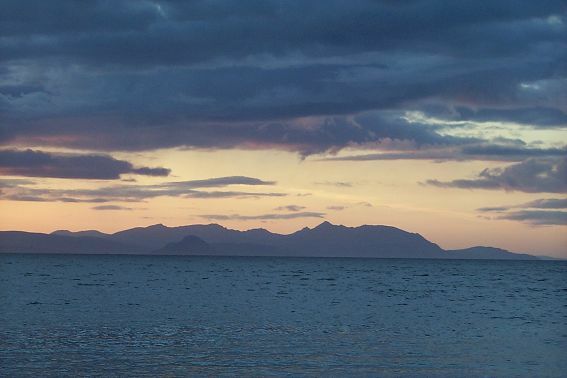 Some miles in the distance was Ailsa Craig, a huge volcanic island lying off the shore and an unforgettable landmark for all who have seen it. We concluded our day with another meal at a local pub and an evening reviewing some of the photos taken with our digital camera. Taking our laptop computer along made it convenient to download our photos and view them on the larger screen. 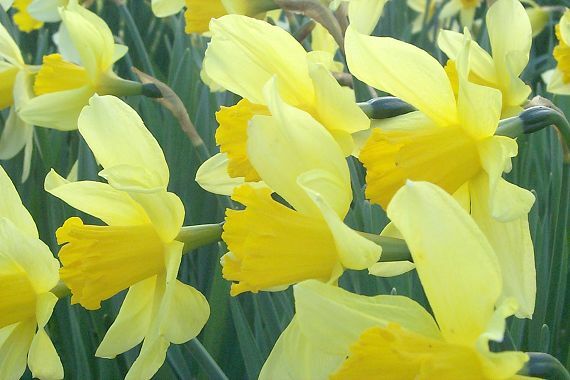 My son Nick, fascinated with the photos of the daffodils he had taken carefully removed a few bugs from the flowers with imaging software while I dove further into the contents of the black box found in Maybole Old Church. Wednesday morning at 10 am we were picked up by an expert in local and family history, David Killicoat, for a trip to the Ayrshire Archives. 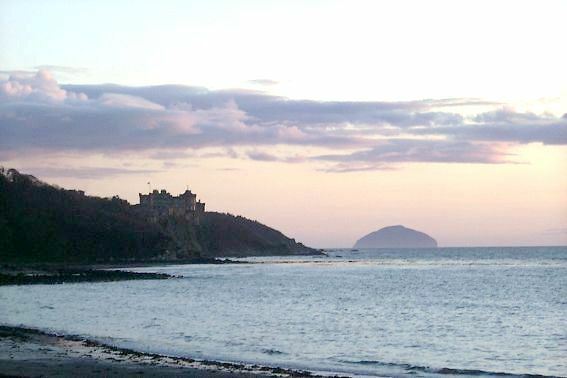 As we drove to Ayr, a coastal town of about 50,000 residents we were treated to grand views of the Firth of Clyde and saw from a distance Dunure and Greenan castles. 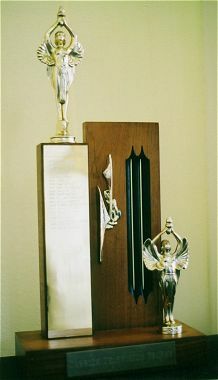 David noted the remote location of Kirkbride cemetery for which he and his father Gordon had recently finished a transcription of monument inscriptions. I was later given the completed project on a CD including photos of the tombstones and an indexed map showing the location of each stone in the cemetery. These will be appearing on the web site later as yet another very useful resource for those searching their Maybole ancestry. Arriving at the Ayrshire Archives we were told that the building had once been a tractor shed. It's rather plain exterior however told nothing of its extraordinary contents. Inside we were greeted by Huw Pritchard, the assistant archivist and shown a conference room where we were given an overview of the work carried out in the facilities over tea. 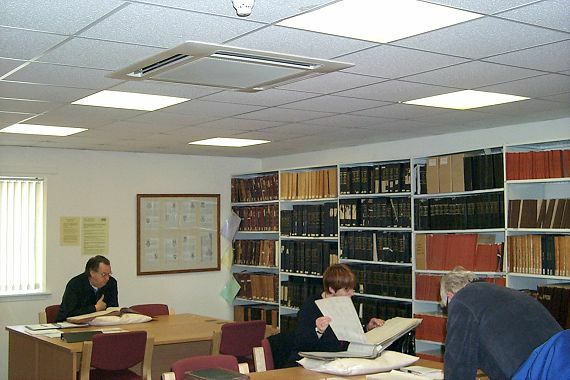 We learned that the archive facilities and staff were established within the last few years when, after a cataloging of the holdings of local towns and villages, it was realized that a tremendous wealth of documents were held within the county and that their preservation should be made a priority. 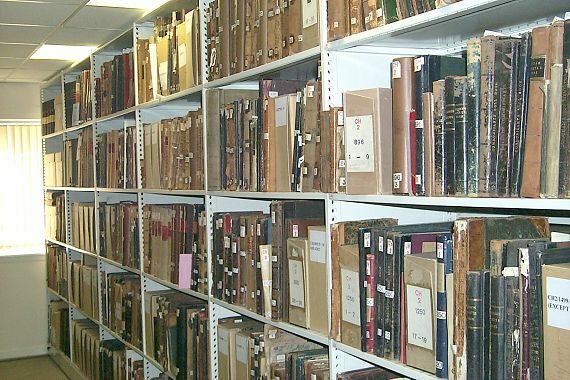 In what will no doubt be seen as a decision made with great foresight many years from now, Ayrshire government agencies decided to create a state of the art archive facility. David, Nick and I were then taken on a tour of the "hallowed" backrooms where the work of the archives was carried out and which the public never sees. We saw documents in all stages of their journey toward becoming cataloged items in the collections. 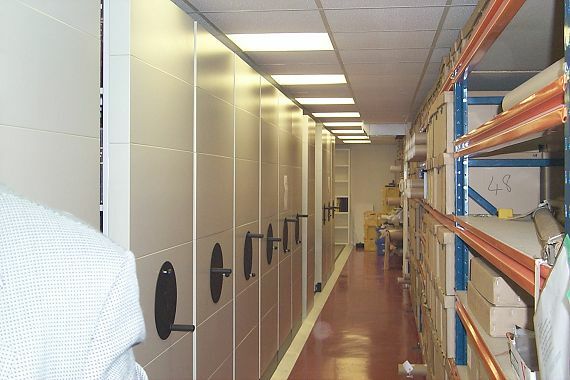 There was a drying room where mold and other harmful elements were treated, sorting and storage rooms closely monitored with temperature and humidity devices and finally a large secured room where the documents were stored on huge movable shelves. This movable shelf concept enabled the room to hold twice the materials it could otherwise have and serve as a further means to secure them. Huw then showed us and allowed us to hold several documents in remarkable states of preservation, which dated to the 1100's. 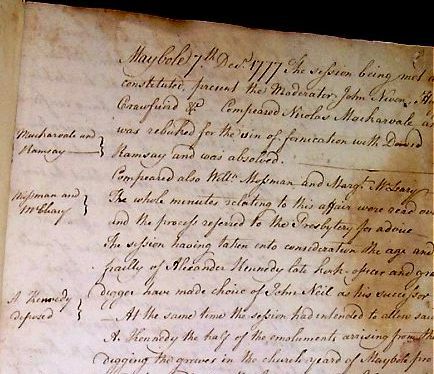 We viewed the Kirk Session records for Maybole, which were also in very good condition for being over 200 years old. The Mormon Church had recently visited and microfilmed many of the documents in the archive but not the Kirk Session records. Many of the entries in these church records document the sexual misdeeds of the members of the church and the penalties handed down by the church elders. Although the individuals have been in their graves many years it could be of potential embarrassment to their living descendants to have the sinful ways of their ancestors revealed. These records are available for public inspection however and on my later mention of their restricted accessibility to James Brown of the Maybole Historical Society he said he could suggest this as an indexing project to the Historical Society. David Killicoat returned us to Drumellan House where we rested a while before our next appointment at the Maybole Community Development Group Offices. At 2:00 p.m. we arrived at Maybole Community Development Group (MCDG) offices where we were to be available to meet with anyone wishing to stop by and say hello and to promote awareness of the website. We were happy to have a number of people drop by to see us and put faces to names we have only seen in email exchanges. One very pleasant surprise was the meeting of Tom Leith my third cousin who drove 40 miles from his farm to the south just to say hello. We had a good exchange on our family history and took a photo to remember our meeting. Nick found a new friend in Brian Wotherspoon, a frequent contributor of spectacular digital photos to the Maybole web site. Their mutual interest in computers and graphics programs kept them talking for some time until it was time to say goodbye … but not before email addresses were exchanged. 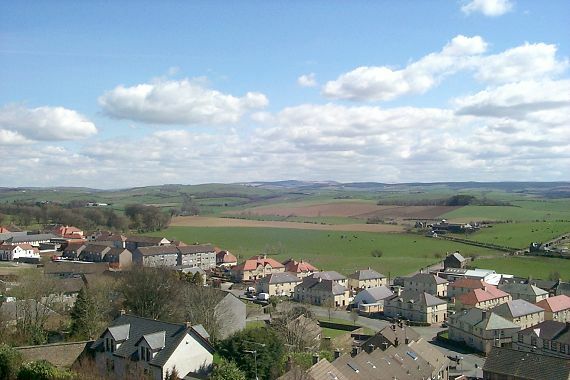 Through most of our stay in Maybole the sun was shining brightly, even enough for me to get mild sunburn one afternoon. Our hosts found more than a little amusement at this since I told them I never get burnt in Florida. This afternoon had been a little overcast until finally Nick looked out the window of the MCDG offices to see that a light snow was falling. Born and raised in Florida this was his first experience with ice crystals falling from the sky. He took the opportunity to spend a few moments outside enjoying the short-lived phenomenon. 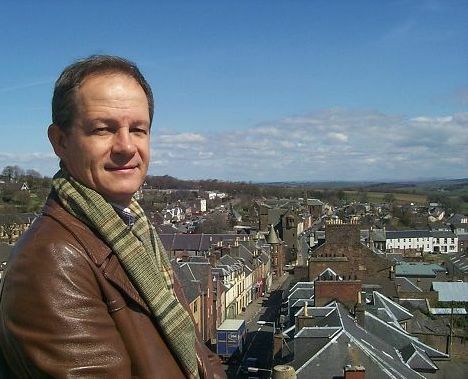 "to acknowledge his contribution, in terms of his commitment and involvement in creating and maintaining the web site ---- regarded as one of the best community sites in Scotland --- he was invited to meet a number of local people. …. Around 40 guests gathered to meet Rich and his 14-year-old son Nick, who is also a whiz on the Internet". 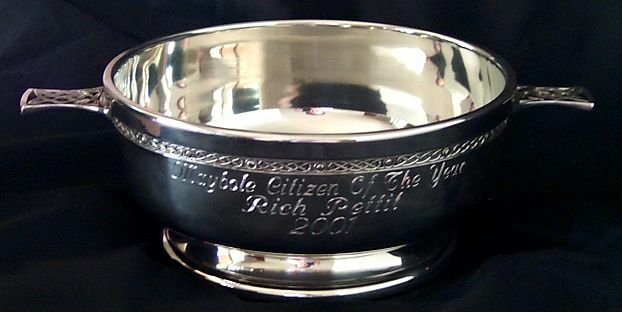 I was presented with the Citizen of the Year Trophy, a large engraved quaich ( a pewter cup of welcome) and an engraved medallion and several gifts from the town were also presented to myself as well as Nick, his brother Mark and my wife Elaine. Elaine and Mark were delighted to receive their gifts on our return to Florida. Nick videotaped much of the proceedings, which included several speeches, photo sessions, more introductions and finally a photo taken of the entire group on the stairs of the castle. I was over whelmed with all of this and told the group present that this award was really a tribute to David Kiltie, those present and all the town's people that had contributed to the development of the web site. I said that I looked forwarded to participating in the site, in whatever form it took, for a good many years to come and that I suspected this was one trip of more to follow. It is an evening I'll never forget and for which I will be forever thankful to David Kiltie for organizing and to all those responsible for making the award and our trip possible. In the course of talking to those attending the event that evening one story told to me was particularly touching. 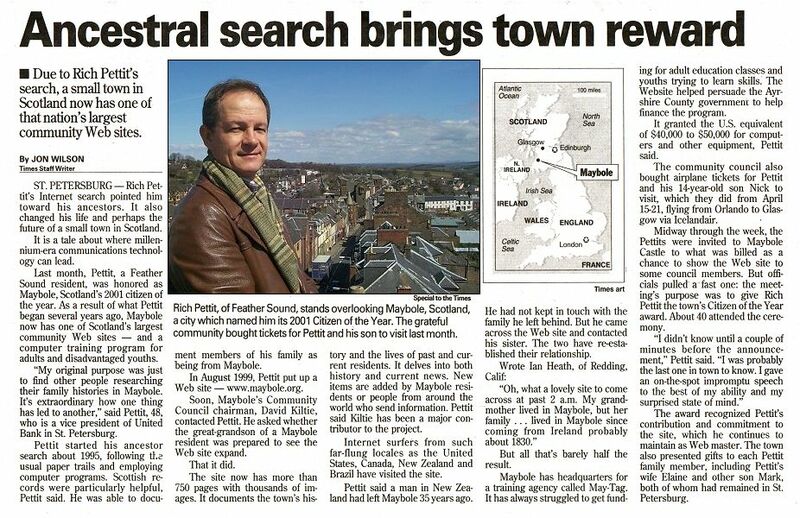 It was of a brother that had left Maybole some 35 years ago and moved to New Zealand. He had not kept in touch with those he left behind in Scotland. 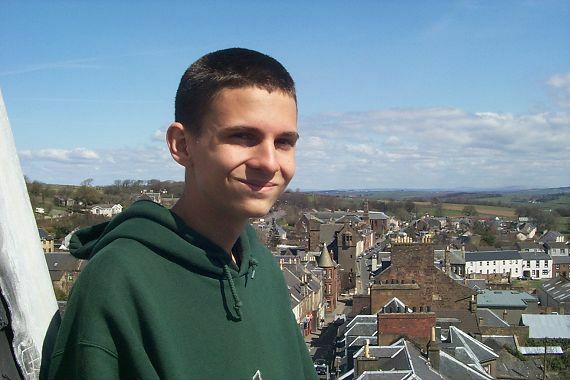 So, it was with great surprise that his sister in Maybole received a phone call recently from her brother in New Zealand telling her he was excited to have found the Maybole web site. Since then he has been in regular contact with his sister and a new relationship has been reestablished after so many years of separation. It is stories such as this that are so satisfying to hear and which serve to inspire me in the "wee" hours of the morning when I am working on the site. Indeed it was after midnight when we left the castle and once again found our way back to Drumellan House. One of the "high" points of our visit to Maybole was the climb to the top of Town Hall. 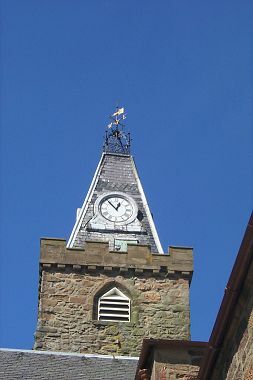 The town clock sits on top of the oldest surviving part of the structure. After climbing a narrow and well-worn circular flight of stone stairs we came to a metal ladder which we ascended about 20 feet. There we found ourselves amongst a bewildering array of old wood beams supporting the clock and chime mechanism. To demonstrate the chime, Derek Walker, the town hall custodian rang it twice. The time being closer to 1:00 than 2:00 this must have caused a few hearing the bell to check their watches thinking it must be later than they thought. 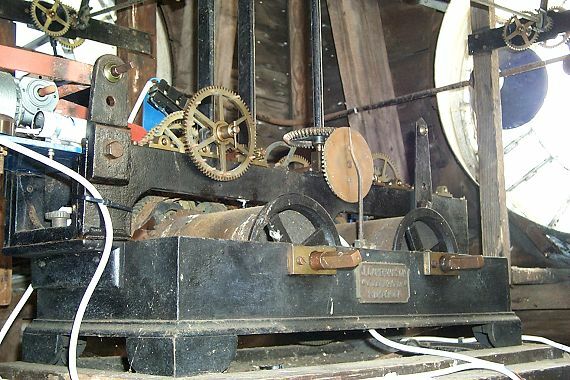 In the side of the little room housing the clock was a small wooden door which opened to the outside of the tower. Nick and I got on our hands and knees and crawled out to the stone ledge surrounding the top of the tower. With the wind, loose wires and low railing it was precarious enough so that even Derek declined to join us but we were able to take some unique photos of the town from this vantage point. There is yet more to tell of this story and I will get to it soon but suffice it to say for now that this was an extraordinary experience for myself and son Nick and one we hope to repeat with the rest of the family again. 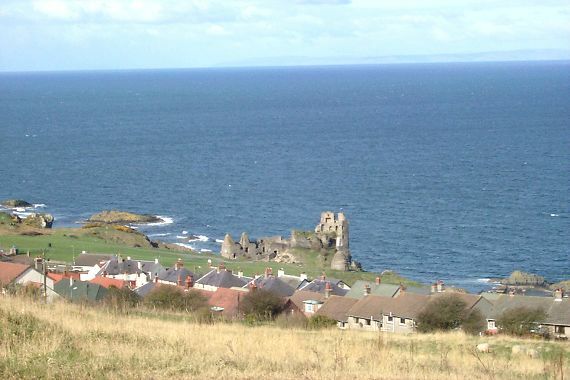 And if you're looking for a 'wee' Scottish town to visit we have one we can suggest to you! Shortly after our return home to Florida an article about our trip was also the St. Petersburg Times. And another article in Family Tree Magazine. A special note of thanks for those that were especially helpful to us.